Summary: Gray Wolf, a boy who lives on the Pacific Northwest Coast with the other members of the Wolf Clan, is tasked by his shaman uncle to find someone important and get to know this person well. 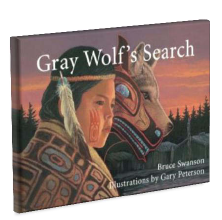 After receiving clues from Eagle, Bear, Whale, Beaver, Owl and Wolf about the person he seeks, Gray Wolf returns to the clan to share his new wisdom. Distribute the Gray Wolf handout to students and help them colour and label the parts of the wolf. Suggested responses are: 1. Large ears; 2. Thick gray, brown, tan, black and white fur; 3. Long, bushy tail, often black-tipped; 4. Long legs; 5. Large, sharp teeth. Learn more about the gray wolf. The gray wolf is an endangered species. Learn more about endangered species. Take a look at the cover of the book. Based on what you see, where do you think the story takes place? Which of the cover illustrations do you think the title Gray Wolf refers to: the boy, the mask or the wolf? What does it mean to search for something? What helps make a search successful? What do you think Gray Wolf seeks? Why does Raven’s Head ask Gray Wolf to find and get to know a very important person? Gray Wolf’s role and the well-being of the tribe depend on it. How long did it take Gray Wolf to search for this important person? About a year. Who was the important person that Gray Wolf was searching for? His family, his community and himself. Distribute the Magnifying Glass handout and have students draw pictures to accompany the statements on the sheet.